Spitfire 3x Prism Scope is rated 4.8 out of 5 by 108. Fixed-power prism scopes have been topping ARs for decades thanks to their simple, compact and reliable design, but few have come close to the combination of value and performance of the Spitfire 3x. A custom BDC reticle, designed to subtend with most popular 5.56 cartridges, takes all the guesswork out of the equation on shots from 0-500 yards. Meanwhile, the glass-etched reticle can be used with either the red or green illumination, or without any power at all like a traditional riflescope, making for an inherently reliable, “Always ready” platform. Brightness Settings Provides five levels of brightness intensity with red and green illumination settings. 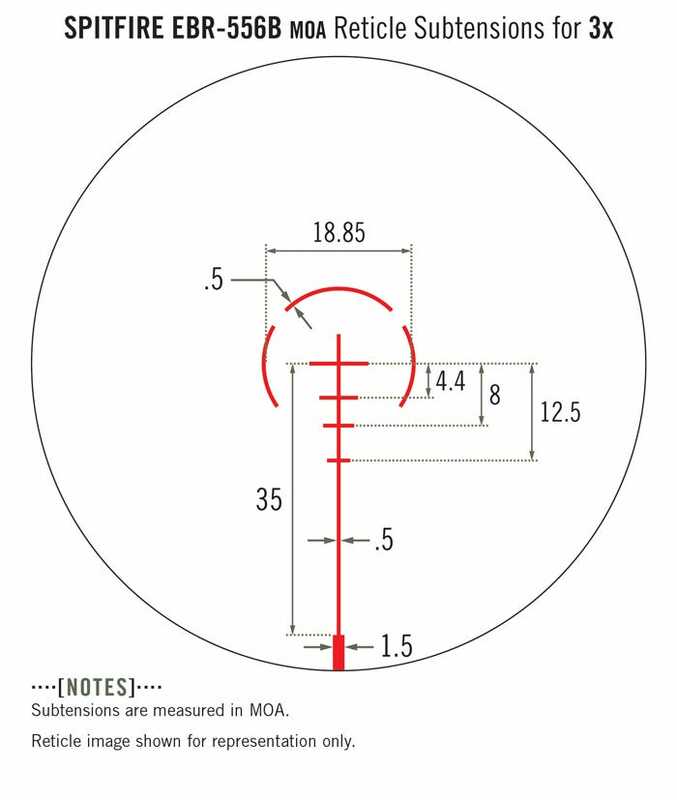 Subtension detail for the Spitfire 3x prism scope with EBR-556B MOA reticle. Rated 5 out of 5 by P272 from Wish I could give it 6 stars I don’t think I can rave quite enough about the Spitfire 3x! I put this on my AR and haven’t regretted it for a moment. Aside from how easy it was to get zeroed in and set up, the clarity and quality of the glass is absolutely amazing. On top of all that the warranty is unbeatable. I think I got more for my money and with better quality than most of the other manufacturers out there. I also just added a Vortex Venom 3 MOA red dot on one of the 45 degree picatinny rail that came with the spitfire. If there is any question as to whether or not to buy this optic...just do it. You will not regret it!! I’m officially a vortex for life devotee. Rated 5 out of 5 by @ from Amazing all around AR optic! I have had my Spitfire 3x Prism Scope for a few years and absolutely love it! I wanted to put an affordable optic on my AR similar to the RCO (ACOG) that was mounted on my USMC M4 without the ACOG price. after receiving the Spitfire I was quite impressed with the craftsmanship and product quality. I think the optics BDC reticle is outstanding and glass quality high. I like the optics compact size and picatinny rail system for mounting reflex sights. Overall I would recommend this product to a friend who is looking for that ACOG style optic without that price! Fantastic product and it looks good too. Rated 5 out of 5 by BVKH from Quallity Product I purchased the Spitfire 3x for an AR that i use primarily for shooting coyotees. I have been more than pleased with this product. Installation was a snap and zeroing was simple enough. Since zeroing I haven't taken it to the range, but I have put it to good use on numerous coyote hunts. The illuminated reticle makes it quick to get on target and stay on target. I find the BDC very intuitive to use. I've used the BDC to drop a coyote at a full trot at 300m with no problems. I'd expect that it'll preform just as well out to the 500m reference. My spitfire has held zero without issue even after several bumps and tumble that occur any time your take a gun for a walk. All in all I am beyond pleased with another one of my Vortex products. Rated 3 out of 5 by TechNeck from good features, poor turrets The scope locks good, and overall the outside is well built. The glass is clear and the reticle and illumination are excellent. Unfortunately the turrets are garbage. They don't track true at all, they move between 0 to 1 moa per click. adjusting it is more of a guessing game then measuring required movement vs moa adjustments. After moving 78 clicks to move 11 inches at 50 yards the scope had also tracked 6 inches left.. you have to bang a few rounds out to "set" your adjustments and figure out if they are going to stay, sometimes they jump a couple moa after an adjustment. This screams "adjustment screws directly on the internal optics tube" that you normally see on $50 chinese optics. Rated 5 out of 5 by Russ from Perfect for my needs This was the first vortex optic I have purchased. I was torn between it and a traditional scope for my AR. I am very happy that I bought the Spitfire 3x. I had no intention of shooting long distances with this gun, as I plan on using for home defense and maybe a coyote or hog occasionally. It was extremely easy to mount and zero at 100yds, and I've shot it out to 200 with no problem using the hashed reticle. I really liked that the reticle is etched, so that it does not need to be turned on to be able to use it. It's also nice to have the option of using green or red with multiple brightness settings. After shooting with this, and my dad's Aimpoint, I can honestly say that it performs much better than his. I'd definitely recommend buying it! Rated 5 out of 5 by Hoytntrapper from Another quality product from Vortex I had originally purchased this sight to put on a shotgun, but after running into a little stag with the mounting I decided to mount it on an AR15. I wanted a sight with high end quality, without the high end price tag and the Vortex spitfire 3X came through with flying colors. I'm a big fan of the EBR (enhanced battle reticle), and the fact the it can be illuminated in green. Also, a big selling point was that the reticle is actually etched on the glass, so if the battery happens to die the firearm will still be useable. The only downfall for me, was that I was not able to mount it on to the cantilever rail system of my shotgun, but has proved to be another great addition to my Vortex collection! Rated 4 out of 5 by Greatshot from I Want to Like It There are 2 faulty issues with this scope but first what I like. Prism, 3 power, optical adjustment. I have sold both of my ACOGs because if you don't have 20/20 vision you are out of luck. I have 20/30 enough to shoot without corrective glasses etc. so I need my scope to accommodate. I don't think my adjusting the "reticle focus" as it is called would effect the field of view BUT I had to place the scope as far rearward as possible and I still have to push my head forward to get a full field of view. Not good. Secondly the reticle is not trued to the perpendicular, it is slanted to the right. 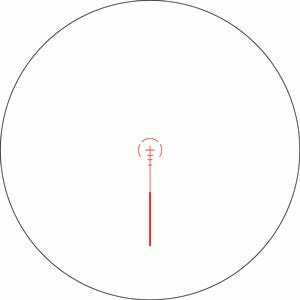 I have a newly patented laser product that proves this so don't just assume some yahoo can't line up a reticle. I don't plan on returning, price is good for what you get. Rated 4 out of 5 by Gastone from No co-witness This appears to be a quality piece of equipment. It just needs some fine tuning. Glass is clear and I purchased it due largely for the etched crosshairs. It does not come with a Quick detach mount and Vortex does not offer one. You have to go aftermarket and pay $79 to get one. My biggest complaint is the scope sits to high and above co-witness height with the provided shim, and without it the scope sits to low and hits a lowered flip-up sight so you have to move it farther forward. With the short eye relief, the only option is to use the spacer and have it sit high. The wire holding the adjustment caps needs to be relocated to a location where it doesn't interfere with the top light turret. Over all it nice, just needs to have a little redesigning.